Here's just a quick couple of photos to show you some work. A lot has been happening, but it's both super exciting and incredibly hard to show in a blog post. When we have more footage the time-lapse will be pretty cool, though. Upstairs, the guys have framed up the side wall in the back. 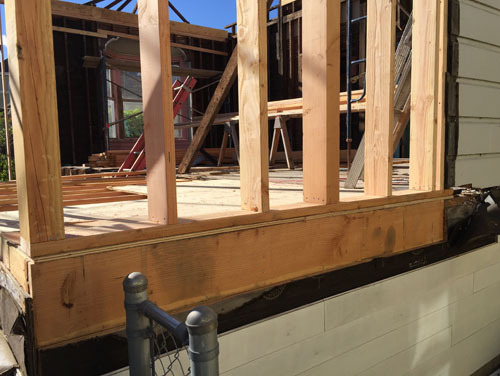 This is where we had to take down the old back porch that had been converted into our old back bathroom. So the wall is as long as it was before, just now actually structurally sound. 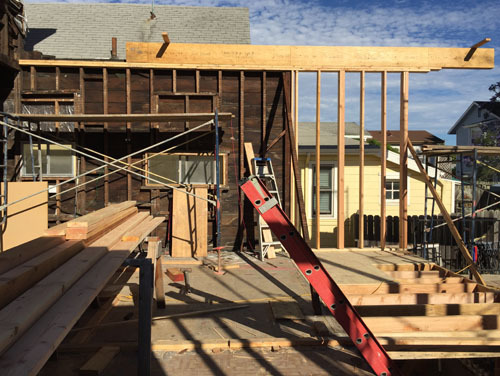 On the second floor, the new back bedroom will cantilever about 36 inches out over the back wall of the first floor. That will give us a nice shelter over the big door there. It's kind of exciting to see good, strong structure where the house has traditionally been so weak. Normally I am more of a fan of retaining as much of the existing structure as possible, but in cases like this, doing so really only makes for a less stable structure. I want this house to last another 140 years, and this is how you make that happen.